Hi everyone! This was a guest post I did last week for Between U and Me. Enjoy! I'm so excited to be here guest posting today. Just a little introduction, I'm Kimberly from The Brown Eyes Have It. I'm trying to be the best wife and mother I can be and having a little fun along the way and I blog about all that includes. Also today is my birthday! Yeah!! 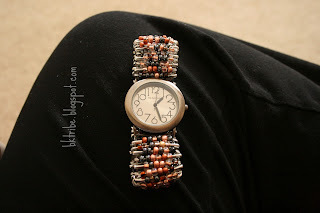 So as I was thinking of what I could post about, what the date was, realizing my littlest three need a birthday present for me, and I wanted a new watch, so that's what we're doing today - an easy safety pin watch or bracelet. you use a face with holes, make sure your cord is small enough to fit through the holes. After you've loaded all the beads onto the pins, start stringing the pins on one of the pieces of string. String them head up, head down, head up, etc. It makes them lay them nicer. Also make sure they're all laying the same way, either the clasp (beaded) side all up or the blank side up, just make sure they're the same. Really, take a look through them and make sure they're all the same, not that I had any experience with this. :) Lucky for me, my upside down one was towards the end. After you've got them all strung on one string, string the other cord through. If you want a bracelet, tie the two ends of the top cord together in a square knot and do the same for the bottom cord. Now the knot won't hold tight, but it'll help you see if it's the right size. Either add or take off pins as needed. 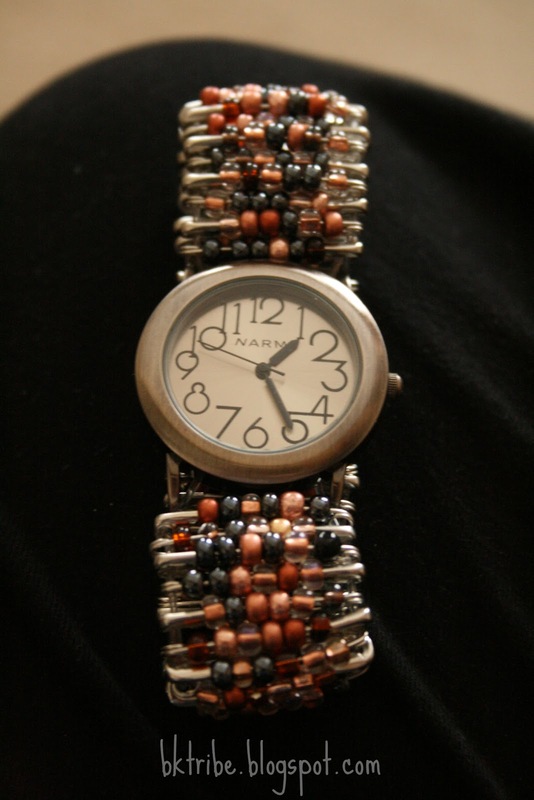 If you're making a watch, thread the cord over the bar and under the face and tie the two ends together. Carefully, try on your watch and adjust to fit. Take it off and flip it inside out with the back of the face, up. I put a piece of tape on the back of the face to keep it clean while gluing. This part is a little tricky. Pull your knot as tight as you can and while holding it tight, drop some glue on it or paint it with nail polish. It's much easier if you have someone help you. Then repeat for the other cord. Cut off the excess cord. Voila! That's it, a totally customizable, cheap, easy, fun watch. Thanks again, Courtney, for letting me hang out with you all today. 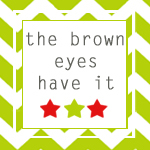 Come visit me at The Brown Eyes Have It. I'd love to see you there! Stopping by from Creative Me to check out your fun project! 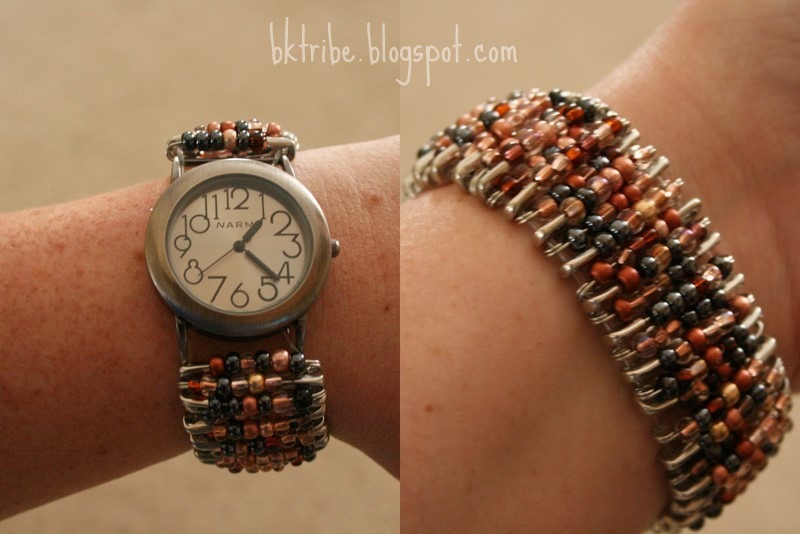 I bought a watch similar to this 2 years ago and was in love with it. I was so sad to lose it. Thanks for the tutorial, I'll definitely be using it soon! So Fun! In grade school we used to make pins like these and give them to each other as "friendship pins". We would pin them onto our shoe laces. How creative is that!!! A great way to have a unique watch! So cute & clever! 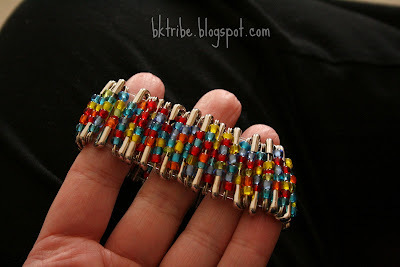 I love this project...great tutorial too! I'd love to have you share this at my party...going on now! What at FUN watch! Thanks for sharing at Terrific Tuesdays. I love this~ This would be such a great thing for my Girl scouts to make for Mother's day or Father's day gifts! Thanks so much for sharing with the Pink Hippo Party.. can't wait to see what you share next! I love it! So pretty and creative. WOW! This is so beautiful and unique! Thanks for sharing at oopsey daisy! oh wow!! what an amazing idea!!! What a great idea. Thanks for our great idea. Your posted watch is really beautiful. I like very much our post. When I am in a casual occasion I always see to it that I am wearing my prettiest bead bracelet.